It's June, it's ODTUG time of year and it's New Orleans... Well, that's true for many old friends and colleagues. I'm still in London writing in the watery sunshine that should be summer. ODTUG feels a little like a milestone for me. It was a conference I always loved and made many good friends over the years. Two years ago at ODTUG in LA, I announced my departure from Oracle after 19 years and in my blog Updates, News and Beta Software later that year, I said that I'd "decided to “hang up my boots” and try something new." This entailed taking a two month break and then starting a new job in the City. It was an interesting switch; still working with the Oracle database, and introducing new graphical software to a new customer base, I joined the craziness that is the rat run into London daily and joined a team in the City. Working in London was great, one can never tire of the view of St.Pauls nor the buzz that you feel when in the City. The truth was that I wanted a break, a real break. Like so many, I'd started working from the moment I got my degree and hadn't stopped. Actually I started working while finishing my degree, so I have 25 years under the belt and really felt I was needed somewhere else. This was a head/heart decision. In my head, the right thing to do was stay in a good job; the economic climate says that, everyone looking for work says that and the job market is just not the place to mess with at the moment. (Besides... as some have pointed out...women over a certain age aren't employable ...! As a Christian, the heart decision was different. The heart decision was to get more involved in my local community, to help others more, to take a step back and let the right thing happen. Besides, I think I have 20 years more work left in me! So that's what I did: Just before ODTUG last year, and with the blessing of my manager at Microgen, I took a deep breath and decided to take a year off, with the view to doing those things I'd wanted to do and get involved. I had no plans, except to let things evolve and to be back earning money by August 2013. If you know me, I'm a frantic list maker and planner, so the lists went off the scale. Needless to say, I have not accomplished all of the hundreds of tasks I'd set out to do, like learning to speak Italian or French or German or even Hindi (one would have been good), but there are a few things I've had fun doing. I should mention that at no point have I been bored, every day is packed (when is there time for work? ), but I've never quite shaken the advice from the head and hoping the heart will triumph! Things started slowly by paring down the world I live in; plans for buying a new house went by the way, I sold my car and did lots of runs to charity shops and free cycle and even filled a skip! (Very freeing stuff!) For soul food and revival I went to the Art Academy in London and did a Summer School drawing class, following that with a class working with green wood at the Good Life centre. This was such fun that I enrolled on a 12 week carpentry course, even more fun and I still have all my fingers. My other half and I switched to another church, as part of a Church plant, when our then current church sent a vicar and a small group of the congregation to start a new church in a multi-cultural community. Here they need "all hands on deck" to get the church and community up and running and we're loving it. I now read with a group of 6 & 7 year olds, at a local school and am involved in other aspects of the church community. Bentley, my beautiful mutt, is now approved at a Pets as Therapy Dog, although we have yet to do our first visit. I have been framing my own photographs for sale on and off for a while and have taken that a step further and now have a shed that you can loosely describe as a workshop, where I'm framing pieces for others. I love to work with the wood and enjoy making bespoke items to suit the artwork. Well, short of giving you my life history here, the final step is finding a new job, and one that will fit in with some of the voluntary work I'm involved with. So, ...I've decided to go it on my own. Some of the small steps have been taken and I'm working on a website, with help, using Joomla! Is there no getting away from technology? Once that's up and running I'll pop back here and let you know. If you're reading this while at ODTUG - have fun. If you're not, stick it in your diary for next year - I can really recommend it, assuming you like technology. Got a minute or two to spare and still not quite sure where DBClarity Developer fits in? Watch the brief introduction video posted on our website: http://www.microgen.com/uk-en/products/microgen-dbclarity-developer. In my last entry I said that I'd watched Tristan's webinar on reusing a SQL query to create insert and merge statements. I enjoyed the re-usability aspect, so quickly created a video to show the feature, not having the patience to wait for Tristan's webinar to be published! The full webinar is now available; we've edited out the noise in the Q&A section, so it's all good content. There are few useful questions and answers on pricing and a snippet of news about the great feature coming in the next release. You can find the video on YouTube: http://www.youtube.com/watch?v=EbLEmZf79Hc. If you missed these webinars, we're re-running the series to coincide with a SQL Server Relay, a 5-day event running in various cities and ending in London on the 30th May and we'll be there! Visit the Microgen/DBClarity website to register. This week we ran a new webinar for DBClarity Developer, focusing on creating SQL queries, first by creating a query and then reusing that query - using DBClarity Developer - to make things nice and easy. I go back and forth on this"nice and easy" because I started life writing SQL at the command line, so visual, graphical queries are still relatively new to me. As I watched the webinar this week, I felt that same twinge of excitement when I show anyone something new. Over the years I have loved teaching and presenting neat features in products. I have not been at a conference or event in over a year, but I couldn't wait to show you this piece of code - hence this little video. It's all easy stuff, and I'm sure you'll like the "reuse" aspect of the demo. I'm stealing a bit of Tristan's thunder. He did the webinar and the demo and in the video below, I'm doing an exact rework of his demo. In the webinar he also talks of the benefits of the product and mentions an exciting new feature in the next release, so you'll have to watch the webinar to get all that news! If your SQL is a little rusty, perhaps it takes a little while to build up a query or if you're wanting to learn new SQL syntax, then take a look at this demo. This is the link to previous webinars and other demos. Do You Need to Learn to Write SQL Queries? I'm an old timer... when I started in the industry years ago, I learned how to create Data Models and write SQL. Yes, yes, I admit, it wasn't the first thing, and it was after I dropped the punch cards on the floor at university...! Didn't we all? In fact I taught SQL for quite a few years before I moved on to teaching application development using the various tools offered by Oracle. By the time I left Oracle, nearly 20 years on, the developers were all learning Java, but we all still need SQL. Generally, if we're putting data into a relational, SQL-based, database and then querying the results, we probably need to know some SQL. I know that's a pretty broad statement, but if you're an application developer and you need to get at data by writing ad hoc queries, it's key to be able to write good SQL. Most of the people I know in the tech industry are old timers too, by that I mean they've been writing SQL for so long they can't remember when they started and it's easy for them, but what about those new to the technology? How do you get up to speed? How do you learn SQL? Do you know the data model of the tables you are querying? Do have access to tools that help you look at the data model? What about tools that help you learn to write SQL? Yup, you know what's coming - if you're starting out, we have a tool that can help you learn SQL. The graphical interface in DBClarity Developer allows you to create, what we call SQL Rules to interact with the database, by building a visual structure of the query. You don't need to know SQL. The great news is, that you can see the SQL created and reuse the SQL once its created and the feedback we've had is that new users are learning SQL. Why not download the product today and see what you can do? There lots of shorts videos on the website to help yo get started and on Tuesday the 17th April, we're running a webinar showing you how to create SQL Rules. Register and learn! This Thursday, 29th March 2012, we're running a webinar on Microgen DBClarity Developer. If you're in the US, then join us at either 13:00 EST or 10:00 PST. If you're is the UK and Europe, then join in at 18:00 BST. We do record our webinars, so if these times are a little inconvenient, then you can wait for the recording later, although a Q&A session after a recording won't happen(!) and of course, that's the benefit of joining a webinar, you can chat to the product manager and ask any questions you might have. If you have not yet tried DBClarity Developer, then this webinar is a great place to start, by showing you how to get started and how to use the environment to graphically develop SQL queries and deploy them to the database. This is the first in a series of webinars aimed at providing you with the knowledge and skills to start rapidly developing modular, reusable SQL queries and procedures. For more about this webinar and the next in the series, please visit the Events section on our website. What do we mean by Graphical, Visual SQL? I have written a few entries about Microgen DBClarity Developer, the new graphical SQL tool we've just launched and would love to hear what you think. Have you taken a look yet? Have you read some of the material and said, "I already have a SQL tool" and gone on to read another blog? What does drag-and-drop SQL code conjure up in your head? When last did you write a more complex piece of SQL and scratch your head just a little to start with? How often do you execute the same piece of code? The graphical aspect of DBClarity Developer means that you don't need to worry about the code, the product does that. You build up the graphical flow and we create the code. The good thing is that you don't need to decide on the database at the outset; you can use this same graphical representation to produce the SQL for Oracle, SQL Server or Teradata. These graphical SQL rules are part of your project, so you can reuse them. Visit the site today. DBClarity Developer is production, why not download and try it out? I'm pleased to announce that Microgen DBClarity Developer is now production and available for download from the Microgen site, where you can also find an overview flyer and presentations, tutorials, short feature videos, and more. For other news, read the following press release: Microgen releases DBClarity Developer. You can also watch the full set of videos on YouTube. Have fun! Let us know how it goes. All contact details are shown on the website. I tried adding a new entry to my blog a few times since my last entry. My plan is to highlight a few key areas in DBClarity Developer so that you can learn a little more about what the product does. I have a list of around 10 topics, which morphs and expands as my ideas change. Having shown you how to “Get Started” in my first video, the next step is to write about the SQL Editor, as described in the presentation, Tutorial 1 - Introducing the SQL Editor , which is on the DBClarity website. There’s the rub..., for those of you who know me and my back ground, I can almost hear you say, “SQL Developer does this and more” or even “TOAD has a richer editor than this”, and so what am I up to? Well, that’s the point, this is a different product. I have created a new video, Microgen DBClarity Developer: SQL Editor, which instead of focusing on the SQL Editor, shows you where it fits in, and then goes on to show you how you can start creating the visual queries, what we call SQL Rules. Take a look. In the next video I’ll take a look at how to deploy your project. Welcome to 2012! Is it Spring in the Air? I'm not sure we've had a winter here, well in the south eastern reaches of the UK at least. It's true that we're walking the dogs in the dark, which means it's winter, but my hands don't stick to the icy metal railings, instead we're walking in the dark to the tune of the dawn chorus! Yesterday a severe storm wrenched trees from their roots and blew things about the garden, but we're still in double digit degrees (that's Celcius) and so definitely too mild to really be called winter; or am I finally getting used to the weather in the UK? Still we're back and at 'em now I hope the break was good, restful and fun. I'm back in London working with the team preparing for the launch of new software. To that end I have done a mini series of videos on how to do a number of activities in Microgen DBClarity Developer. Instead of listing each video, I have created a YouTube playlist - the videos include "Creating Database Connection", "Adding files to Projects" and "Deploying Projects". I see that Lewis Cunningham is doing a free webinar on SQL Developer 3.0 for ODTUG in January. 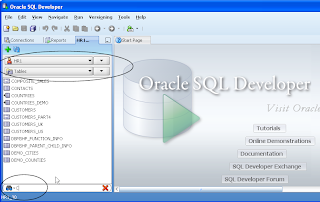 Here is his post on the news http://it.toolbox.com/blogs/oracle-guide/sql-developer-30-new-features-webinar-43499 There is a link to register and a bit on how he uses SQL Developer in his day-to-day tasks. Here http://www.odtug.com/apex/f?p=500:235:0::::P235_NEWS_ID:3061 is a list of free ODTUG webinars posted for 2011. First Webinar on DBClarity Developer - Learn More! Conference season may be over and you may all be into the swing of the end of year activities, but things are still happening here. DBClarity Developer Beta 1 has been out for just under 2 months and we're about to release a second beta. Before we do that, we thought we'd show you more about the product and give you the opportunity of seeing what it does and to ask questions. Register for the live Microgen DBClarity Developer Webinar to be run on Thursday 15th December, and because this is a webinar, it's "at a city near you"; just join in, watch, listen, learn, and ask questions. DBClarity Developer is a standalone product that provides a graphical interface for creating SQL queries, procedures and functions. The beauty of the graphical interface is that you can create the code graphically and let the product build the SQL, once done, you can revisit the diagram. It's great for maintenance because you don't need to trawl through lines of code, in an attempt to figure out what it's designed to do, and it's great for collaborative work, because the visual aspect helps when you're explaining how the code works. DBClarity Developer generates SQL code for Oracle, Teradata and SQL Server and works alongside your other development tools. Why not join the webinar, take a look and see what it's all about? Register here: Microgen DBClarity Developer Webinar. There are teams outside Oracle who are also writing extensions for SQL Developer. You can see a list of them here - SQL Developer Third Party Extensions. Listed on the site they're pretty harmless; you can look at the list of extensions, review the individual websites and decide to download and include the extension or not. Extensions can also be added using Check for Updates. If your company allows you to download software from OTN and other sites, then this is an easy way to get new updates and extensions. SQL Developer is no longer using this Check for Updates facility to update the core functionality. We only use it to advertise when there is a new release available and if we have a full new extension for download. We also use the Check for Updates utility to help you download and install the correct drivers to connect to some third-party databases. In the end the Check for Updates utility is most useful for our customers and partners who are developing extensions. Yesterday I added a number of new extensions to the Check for Updates Utility and updated a few of the existing extensions. Start up your current release of SQL Developer and select the menu Help > Check for Updates.... Navigate to Step 2 to search through the various update centers available. You may be prompted for Proxy details if you have a firewall, once that is confirmed you'll be presented with the screen below. If you have a local file, which you have downloaded or even created, then you can select "Install from Local File" and complete the install. 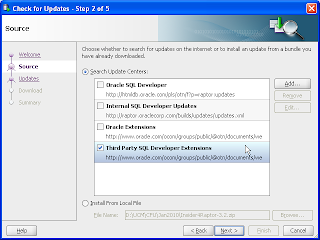 For Oracle, SQL Developer or customer created extensions, select the "Search Update Centers. Oracle SQL Developer: All version control extensions and any announcements about the latest SQL Developer release. 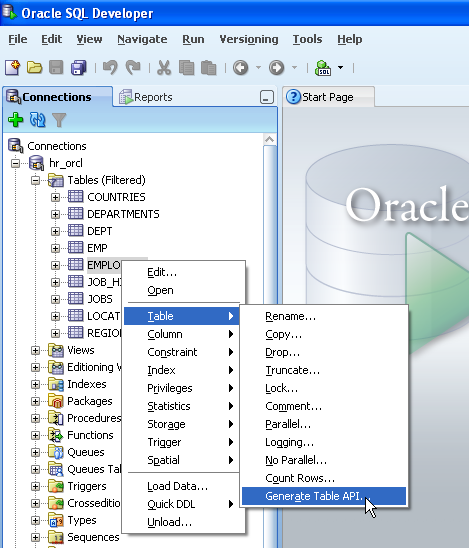 Oracle Extensions: All extensions created by Oracle teams external to the SQL Developer team. This excludes extensions we automatically ship with the product, like the TimesTen extension. 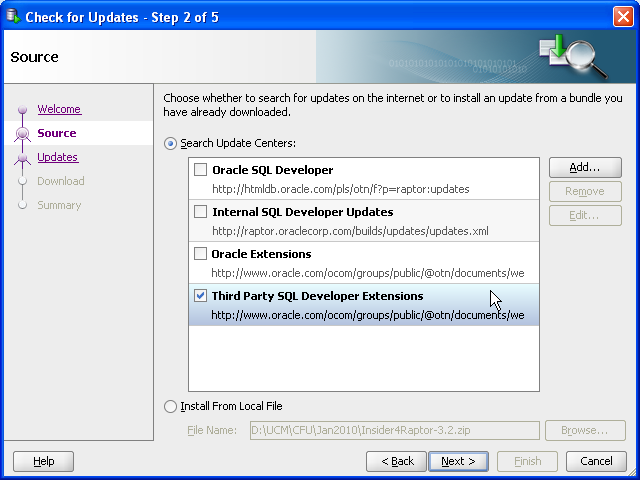 Third party extensions: This lists all extensions not developed by Oracle and includes some third-party database drivers. All extensions are listed alphabetically and each has a description and version details. Select each extension you want to install and click Next. Most extensions have license agreements associated with them. Read and accept each license. Once you have agreed to all licenses, the extensions will be downloaded and installed. All extensions will be installed in the \sqldeveloper\sqldeveloper\extensions directory, where you installed SQL Developer. Oracle does not test these extensions and you should be aware of what you are downloading and installing. You should also be aware that some extensions are free and some have a free trial period. Most if the extension developers are active on the SQL Developer forum. on OTN so if you have queries about the extensions, ask them on the forum. I hope you take an opportunity of popping over to Kris's blog - he's just done a piece on the new pdf support in SQL Developer 3.0 The pdf support is great when you export your data you can export it to PDF. But not just that - there are loads of settings to control and format the file. Take a look at his encrypted pdf blog for a taster. I want to tell you about the Schema Browser. This is a great feature for those of you who work with objects you don't own. So for example, if you have access to run queries or update tables that have been created by another schema, in all releases, including SQL Developer 3.0, the way to review these tables is either through the Other Users node or by creating synonyms for the tables and then having the tables displayed via the synonyms in your own connection. So it's a little fiddly. 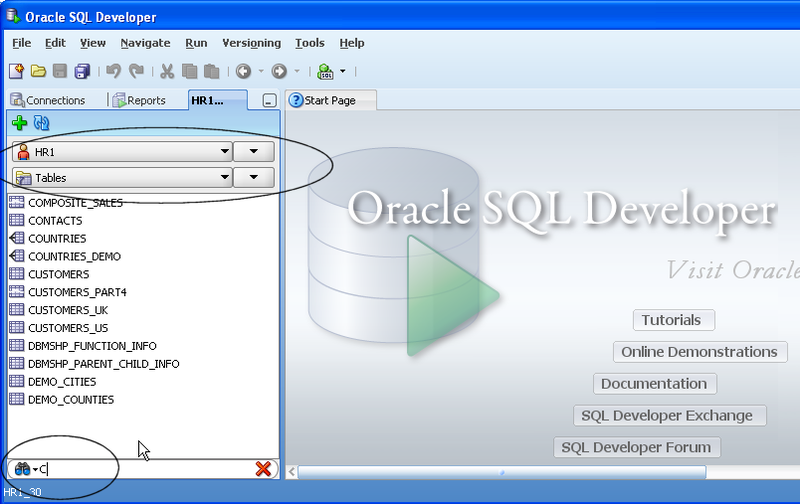 In SQL Developer 3.0, we have added in a new schema browser. To find it, select a connections, right-click to invoke the context menu and select Schema Browser. This opens a new navigator for that schema. Now you can do a number of things. Firstly, select the schema you want to work with. This is equivalent to finding the user in the Other Users node. Then you can select the object-type you want to work with. Let's say, for arguments sake, that you select tables - You can filter the tables listed. The filter option is the same filter dialog you can use to filter any of the nodes in the Connections navigator. In the image, I have circled the first two options. The filtering criteria can be set by using the additional drop lists. There is another filter - it's a client-side filter - and this allows you to quickly filter objects in the already filtered list. In my example, I have a number of tables in the filtered list, and then I have reduced the list further by using the extra client-side filtering. Well, I couldn't wait a day to do another post. Here is a feature you would not have seen at OpenWorld. 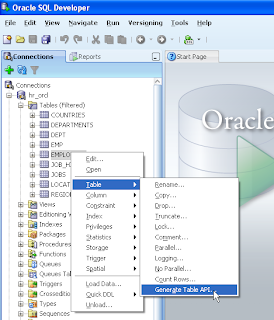 SQL Developer 3.0 generates a Table API. Now those of you who go far back enough will know other tools that did this and we have had a number of feature requests to add in a table API generator, so here we go, a TAPI! What a funny old world this is, the more things change, the more they stay the same..., more of that thought another day. What I can tell you is that Tristan's webinar introducing DBClarity Developer is now available to listen to and watch. This is just over 30 minutes and should show you where DBClarity Developer fits into the scheme of things - specially if you're still thinking it's another SQL Developer or TOAD tool. Go on try it. For a tool new to this market, it's interesting to see which companies are looking at DBClarity Developer and why they are - the story is the same - They have loads of developers, building ad hoc reporting queries and they want them to be efficient. (that's both the developers writing the queries and the queries themselves!) Now we know we can't all be SQL gurus, so if we can use a tool to produce more efficient SQL Queries then why not? So if you have 100s of developers writing ad hoc SQL reports, have a look at DBClarity Developer. Today is as good as day as any as we have just released DBClarity Developer Beta 2! I've spent the last few days recording more demo videos and will publish a few of those in the next few weeks. So What's Different Then? Are you a PL/SQL Developer? Microgen's tools are new to me, and having worked with Oracle for so many years, I need to see where they fit in and why they may be of interest to you. I'm going to do another video to show you more "How To..." bits, but I thought the screenshot on our website might go a long way to helping you understand. The graphic on the left hand side is what you build, the code on the right hand side is what the product produces. I think it's really neat. The main idea is that business end of the procedure can be discussed with a business user. Take a look at Tristan's blog entry today, where he talks about just that "Why Microgen DBClarity Developer?" He's the product manager and has worked with customers and the products for some years. There is a Free Download of DBClarity Developer (Beta), if you'd like to try it out. What does that mean? Sometimes it’s difficult to get passed the marketing as you try to develop a real understanding of what a product can do for you. In the case of DBClarity Developer, what do I mean by a “graphical design” when it comes to writing SQL code? Lots of database-related products allow you to create SQL queries using a drag-and-drop approach, so what’s new here? Well, before I get into all that, you should take a look at the product. It’s always been a bit of a challenge for me to tell the story of a product in 5 minutes! I tend to be overenthusiastic while I attempt to show users every available feature. That may be fine if you’ve used the product in question before, as this approach can help to fill in the gaps, but if you’re new to a product, it’s overwhelming at best. With this in mind, I’ve created a short video (Posted on YouTube) to walk you through the first few minutes of working with DBClarity Developer. Those of you who follow my blog, know that I write from time to time. I started blogging back in the day when I was working on modeling and the SQL support offered in Oracle JDeveloper and then in 2006, started this blog with the launch of Oracle SQL Developer and then later to SQL Developer Data Modeler. Recently my blogging dropped right off because, after 19 years at Oracle, I decided to “hang up my boots” and try something new. Although taking photos in Cornwall really appeals, it seems that when we decide to start fresh, perhaps we don’t venture too far from where we’ve been before- well, it is true for me. After a restful, technology–free 2 month break, I started in a new position at Microgen, a company based in the City of London. (I can see St Paul’s Cathedral from the window!) I’m in the Microgen Aptitude Solutions Division; so still in technology, still working with products that build applications and still talking to databases. My new laptop has SQL Developer on it and I can connect to an Oracle Database! 4. Whether you switch views or not, expand the SQL Rules, select and double-click to open the rule. This displays a visual representation of your SQL Query. 5. To see the SQL Query, select the Show SQL icon. For more help and information, take a look at the set of tutorial slides related to the examples on the website. As for my history…I see that SQL Developer Data Modeler 3.1 is now beta. Have fun with that! On Tuesday 19th January, the SQL Developer team released a third early adopter for general use. This SQL Developer 3.0 EA3 now includes the full Data Modeler 3.0, which is also running in an early adopter cycle. The significance of this is that you can open and edit data models from within SQL Developer. If you are not a modeler, then this extension should not be in your way, but if you like to move between the Data Modeler and SQL Developer and prefer to work with one tool, you can. The browser menu is available under View > Data Modeler > Browser and if you want to change any preference settings, just select Tools > Preferences > Data Modeler! If you have any feedback on the integrated offering, then post a message on the forums: SQL Developer Forum or the Data Modeler Forum.